Dr. Martin is a native Texan and graduate of Texas A&M University in College Station, Texas. He completed medical school at the UT Health Science Center in San Antonio where he graduated with Alpha Omega Alpha and Gold Humanism honors. 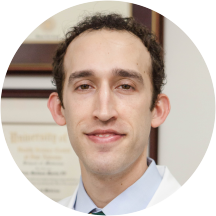 He completed his Dermatology residency at the UT Health Science Center in San Antonio and was Chief Resident from 2012-2013. He has numerous publications and affiliations including the American Board of Dermatology, American Academy of Dermatology, Bexar County Medical Society, Texas Dermatological Society and San Antonio Dermatological Society. In his spare time he enjoys spending time with family, riding horseback and outdoor activities. He currently practices at the Medical Center location. Dr. Martin is the best! He knows exactly what you need in a matter of 10 minutes. He has helped me so much and i couldn’t be happier. Dr. Martin was great. He took time and explained all options. I am extremely hopeful and optimistic that he will help me tackle my condition in the right way. Dr Martin is knowledgeable, professional, and thorough. He took into consideration my personal circumstances when determining my treatment. I would recommend him to family and friends. I've seen Dr. Martin twice and both times he's solved my issues on the first visit and didn't require me to run around to other specialists or schedule tedious follow ups. Super quick and effective with absolutely no rushing! We arrived on time and the staff was very professional. After completing some additional paperwork, we only had a ten minute wait. Probably the best Dr. appointment that I have ever had. Dr. Martin is a thorough professional, and I felt at east during the entire visit. He was very nice and knowledgeable. He wasn't pushy. First time to your office and I have to admit the wait was not that long. Anything less than thirty minutes is quick. Really enjoyed the visit. Thank you! He was kind, thorough and very helpful. Dr Martin has excellent rapport with teenagers. He listens, is very knowledgeable & teaches patients about treatment options. He is also very helpful with prescriptions. My wait time was less than 30 due to having to fill out new patient paper work. Dr. Martin was receptive to hearing the history to my concern and provided helpful treatment recommendations. He is very respectful and professional. In and out in 30 minutes. Thank you Dr, My Symptoms are gone. Dr. Martin was great. He made me feel comfortable at my arrival as well as throughout my entire appointment. I had a short wait to see the Dr., which is a huge deal for me. I hate making an appointment onlyto sit in the waiting room an additional 30-45 minutes. Im looking forward to my follow up with Dr. Martin and i will definitely recommend him to anyone looking for a great dermatologist. It was excellent and the doctor is very friendly and helpful! Dr Martin takes the time to explain in detail and answers all your questions. Very pleasant experience. Dr. Martin was very personable and professional. I would definitely recommend him. Dr. Martin is very knowledgable and has an excellent bedside manner. He takes the tie to explain everything so you understand. I would highly recommend him! Dr. Martin was very kind and professional. He makes his patients comfortable with detailed information. Dr. Martin is a fully qualified exceptional Dermitologist. He has a great bedside manner and is a qualified surgeon. He returns calls personally. I would highly recommend him to anyone. Dr. Martin was very professional and took good care of me. He had a great bedside manner and listened to my concerns. I would highly recommend him! Love Dr. Martin and his staff. No waits on appointment time, see's you as scheduled. Takes time needed to explain and answer any concerns, never rushes appointments. Thank You Dr. Martin and Staff. Dr. Martin is attentive and will address any issues or concerns in a professional matter. I definitely recommend Dr. Martin. Awesome Doctor! Office Personnel were very friendly. Excellent Doctor! He understood what I was going through and checked me completely. He answered all my questions about my problem with Acne and gave me a treatment. Couldn't be happier! Really wonderful experience. I saw the doctor promptly (both entering and having him arrive), he went over my previous history in detail, asked great questions, did a full exam, explained his recommendations, and made sure that I had everythingI needed. As a big plus, I never felt rushed and he was very warm / welcoming. Once again, Dr. Martin was professional, knowledgeable, caring, helpful, and took care of us quickly. I wish every doctor was this good! He even saved us money by referring us to another pharmacy! My whole family will continue to see him! Didnt feel like he was really engaged in my concerns. Good follow up but not enough information given. As always prompt and professional.